No matter where you live in Southern Ontario, ants will be a problem in your home if you don’t take preventative measures. Two ants in particular are going to cause problems, and these are carpenter ants and pharaoh ants. The good news is that Anypest can remove these ants for you, however we are big on preventative maintenance so here are a few tips. Carpenter Ants are the larger type of ant, and they like to live in your walls and woodwork. Once they nest in your home, you can have up to 3,000 ants wandering about at night (they are nocturnal), per nest. There can be multiple nests per home, which means you could have upwards of 6,000 or more ants living with you. With thousands of ants chewing through your walls, woodwork, windowsills, etc, structural damage can happen fast. Alate: in ants, a winged, sexually mature individual. The interesting thing about Carpenter Ants is that they sprout wings when their nest becomes too large, so they can scout further to find a new home. If you see winged ants in your home, chances are you have a nest that is full capacity of 3,000 or more of these pests. If a couple of ants appear in your home after years of not seeing them, be aware that these are scouting ants. If they spot food, they’re going to report back to the nest that it’s time to move in. This means you should vacuum your kitchen, clean up crumbs and put food, particularly cereal, into air tight containers. Other steps you’ll want to take is to rinse off your plates before they go into the dishwasher, stay on top of dirty dishes in the sink, and not leave glasses of pop, coffee and water left about. Carpenter Ants like the same foods we crave, which are foods that are high in protein, fat and sugar. You’ll need to keep meat out of your garbage (you can freeze scraps of food until garbage day) and you should avoid keeping open pop cans left about. If you have children, it’s not uncommon to find chip and cookie crumbs in the folds of your couches and furniture. Make sure to include these areas in your vacuuming routine. If you have scrap pieces of wood in your backyard, or piles of brush, clean these items up. Your neglect will attract ants to your yard, which will naturally lead to your home. If you keep your recycling bin outside, don’t rest it next to your wall, and rinse all your containers out with soapy water. If you feed your pets outside, clean their bowl daily to reduce the attraction of ants. 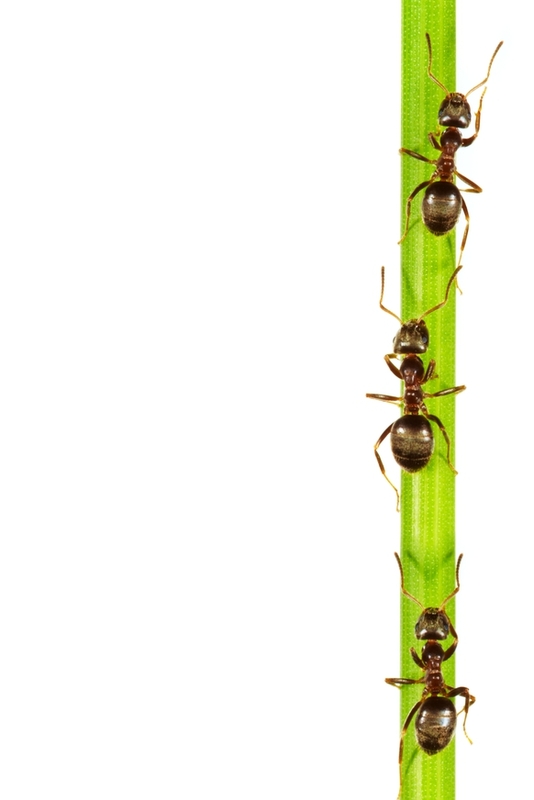 Ants will naturally enter your home through anything that is touching it. You’ll need to trim branches, or shrubbery that allows for a natural path for ants to crawl into your house. If you have wood on old barns or your windowsill that has yet to be treated, paint them/stain them as they won’t be as appealing for ants to chew through. Pharaoh ants are extremely tiny ants that are tough to get rid of as they make their nests in very hard to reach places. Unlike Carpenter Ants, where you’ll only see a few at a time, Pharaoh ants will flock by the dozens to a fallen piece of pineapple or drips of ice cream. I remember visiting a friend on Upper James and Fennel in Hamilton, and seeing a battle between hundreds of Pharaoh Ants, and a four inch centipede. It did not take long for the worker ants to make a quick lunch of the centipede as these little guys will eat anything. Caste: within a colony, any set of individuals having both a distinct form and specialized behaviors, such as Worker Ants and the Queen. The same rules to Carpenter Ants generally apply to Pharaoh ants in that you need to keep your house free of food. This means vacuuming frequently, especially around windows and air vents where dead insects tend to collect. Pharaoh Ants are attracted to open sources of water. If you leave glasses of water around, you’ll start to notice these tiny ants crawling in and out of these, and frequently drowning inside of them. You’ll need to keep your coffee pot and tea kettle empty of water as well. Wipe up any spilled water around kitchen and bathroom sinks and showers to keep these ants away. Even the slightest spill of water on a counter, will attract these little critters. European Fire Ants are a new species of ant that seem to be moving into the area. Richmond Hill, for example is undergoing a major infestation, while Whitby and Toronto have had these little ants for quite some time. These are little red ants are highly aggressive and have a painful sting. The fortunate thing is that these aggressive fire ants won’t invade your home. They tend to live under rocks and stone and burrow three to four feet underground. They will colonize in your backyard, and a professional such as Anypest should be called to remove them for you. Satellite Colony: A colony forming away from the main body of the colony but still remaining connected with it. Odorous Ants somewhat look carpenter ants but differ in that they stink when you crush them. They smell like rotten coconuts. These ants also will tend to live in colonies with other ants, which is why you might see these ants mixed with other ants. To avoid getting an odour ant infestation, be sure to apply the same precautions as you would with carpenter ants. Finally, we have Citronella Ants which get their name as they smell like Citronella when you crush them. Early spring often brings us calls from customers about hundreds of winged insects that swarm up from basement floors or out of the attic. Over the past two decades we are getting more reports from these ants along Lake Ontario, particularly Grimsby, Burlington, Oakville, Stoney Creek and Mississauga. Usually when they swarm the house it is for mating purposes and it for a few hours. However the sight of hundreds of ants crawling out of your floors is very distressing. 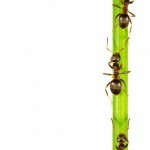 There isn’t much you can do to get rid of these ants except get rid of their colonies. They typically don’t eat people food, but are thought to tend aphids and collect the honeydew they excrete. (similar how to dairy farmers keep cows for milk). This entry was posted in Blog on 2014/07/14 by Any Pest.